The votes are in, and it looks like 'Vulcan' could be the new name for one of Pluto's smallest moons. After weeks of online ballot casting by people around the world, the poll asking the public to name two of Pluto's moons — currently called P4 and P5 — ended today (Feb. 25). As of 12 p.m. (1700 GMT), the polls closed with a total of 450,324 total votes cast since Feb. 11 with 'Vulcan,' a Pluto moon name proposed by Star Trek's William Shatner, is the clear winner. "174,062 votes and Vulcan came out on top of the voting for the naming of Pluto's moons. Thank you to all who voted! MBB," wrote Shatner via Twitter. Cerberus came in a clear second with nearly 100,000 votes. Vulcan was a late addition to the Pluto moon name contenders, and pulled into the lead after Shatner, building on his Capt. James T. Kirk persona, plugged the name on Twitter. Vulcan, the home planet of Kirk's alien-human hybrid first officer Spock, is not just a fictional world in the Star Trek universe. It is also the name of the god of fire in Roman mythology, and officials at SETI added the sci-fi favorite to the ballot for that reason. "Vulcan is the Roman god of lava and smoke, and the nephew of Pluto. (Any connection to the Star Trek TV series is purely coincidental, although we can be sure that Gene Roddenberry read the classics. )," wrote SETI scientist Mark Showalter in a blog officially adding the name to the list on Feb. 12. "Thanks to William Shatner for the suggestion!" These votes don't necessarily mean that P4 and P5 will end up being called Vulcan and Cerberus, however. SETI is going to recommend the winning names to the International Astronomical Union — the organization responsible for naming the moons. The IAU will take the results into consideration, but ultimately they have final say over what the tiny moons are called. Pluto has five moons that astronomers currently know of. 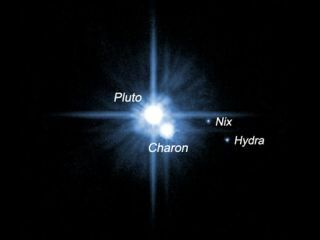 Scientists first caught sight of Pluto's largest moon Charon in 1978, but it was not until 2005 that astronomers discovered two other moons (Nix and Hydra) using the Hubble Space Telescope. The moon P5 was discovered in 2012, also using the Hubble telescope . The moon P4 was discovered in 2011. Both P4 and P5 are only 15 to 20 miles (20 to 30 km) in diameter. Voting is closed, but you can still see how your favorite names did on PlutoRocks.com.